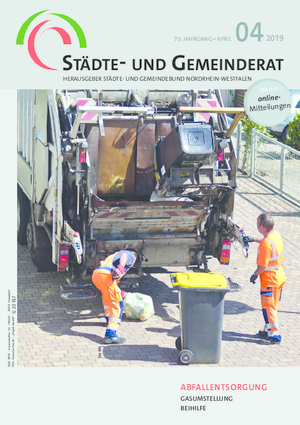 Since 2006, the NRW Municipal Agency (Kommunal Agentur NRW GmbH) has been operating as a service company of the North-Rhine Westphalia Local Authorities Confederation (StGB NRW), under the aegis of the NRW Municipal Foundation. The company was initially founded in 1996 with funding from the State of North Rhine-Westphalia as a Municipal Foundation called Abwasserberatung NRW e.V. (sewage consultants). Reflecting the expanded range of services provided, the company has since 2012 been operating as the municipal agency Kommunal Agentur NRW GmbH. The NRW Municipal Agency offers responsively tailored solutions for technical, legal and organisational municipal issues, designed to harmonise aspects of cost-efficiency and environmental protection. This also includes supporting municipal tenders for procuring goods and services. On behalf of the NRW Ministry of the Environment (MKULNW), the NRW Municipal Agency (PlattformKlima.NRW) advises and supports municipalities and counties in their remits themed round climate protection and adapting to climate change.